We often hear about the healing power of yoga, but the specific benefits for breast cancer patients are less talked about. 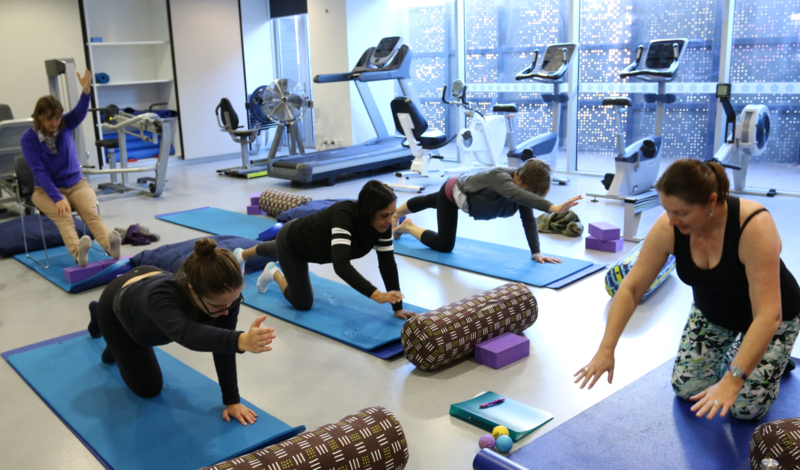 Researchers looking into the wellness benefits of this meditative form of exercise have uncovered evidence of how it helps breast cancer patients and survivors both physically and mentally. Yoga is about self-care and is a transformative experience designed to change the way we relate to stress, relationships and our lives. Gentle yoga is practised through poses, known as asanas, along with simple breathing techniques and relaxation practices. It can significantly reduce fatigue, stress and depressive symptoms in breast cancer patients, while giving them increased vigour and vitality.2 The asanas help develop strength and flexibility and promote relaxation. Sleep disturbance due to cancer treatment is a predominant symptom for many patients. The peaceful and meditative practices of yoga help the body relax which leads to improved sleep. This in turn increases cell activity for an optimally working immune system that is crucial to healing. 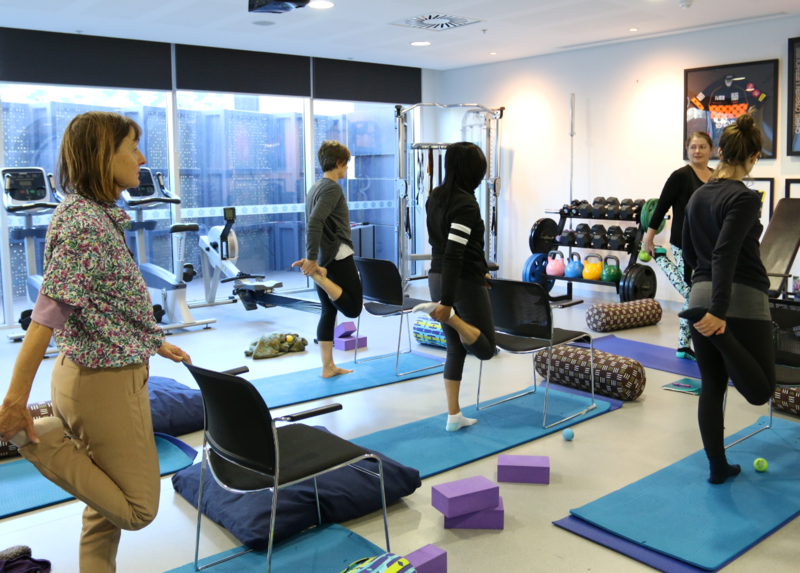 Yoga therapist Margery Hellman has been at the forefront of making yoga a significant part of breast cancer treatment at Chris O’Brien Lifehouse for the last four years. She has journeyed with countless patients from the early stages of their treatment right through to survivorship. Margo McDonald is one of these patients. 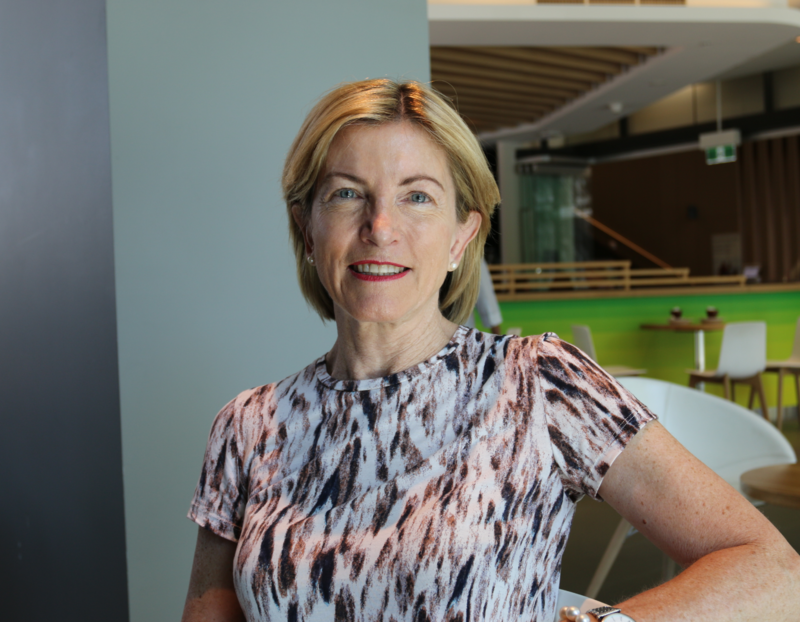 She has been attending yoga classes at Chris O’Brien Lifehouse since her initial breast cancer diagnosis almost two years’ ago. Mandy Lamkin is another patient taking Margery’s classes. Initially Mandy was reluctant to engage in any physical activity during chemotherapy. “I couldn’t imagine exercising during that period, it was really extreme,” she admitted. The classes run twice a week and combine gentle breath-centred movement, breathing practices, relaxation and meditation. She strives to accommodate patients at all stages of their treatment process, customising each session to the person’s needs. And, where needed, she works closely with a patient’s other treatment providers to make sure that the yoga therapy is as beneficial as possible. 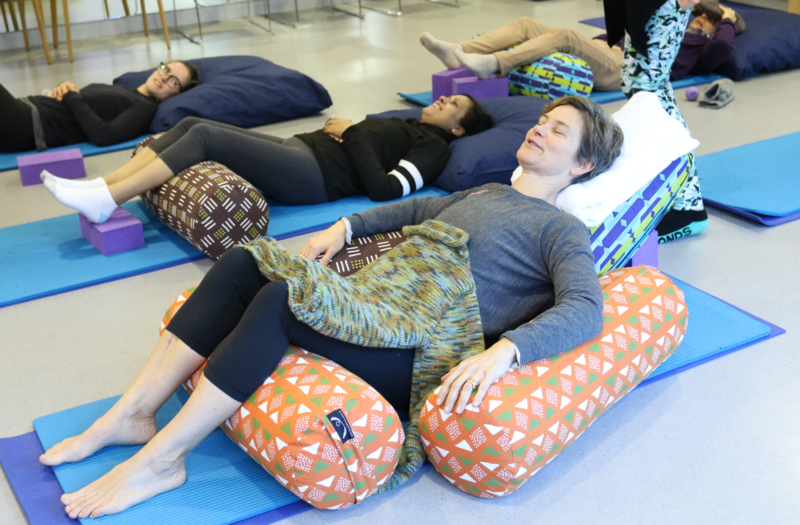 Yoga therapy is an important element of Lifehouse’s supportive care services, providing not only a space for patients to undertake physical activity conducive to their health condition, but also a community where they feel comfortable during their healing process. “You build relationships through the yoga class. It really helps to talk to someone who is going through the same thing and to be able to ask questions in a safe environment,” Margo shared. 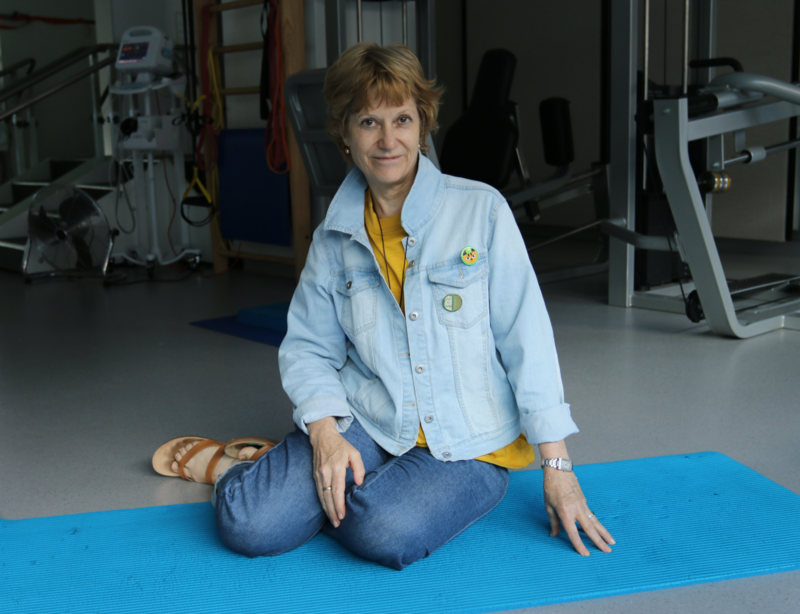 Gentle Yoga classes with Margie and Lisa are held on Tuesdays and Fridays at 11:45 am in the Lifehouse LivingRoom. Yoga mats and equipment are provided for all attendees. For enquiries or to book a session call 02 8514 0038 or email livingroom@lh.org.au. Rao R.M., Nagendra H.R., et al (2008) “Influence of yoga on mood states, distress, quality of life and immune outcomes in early stage breast cancer patients undergoing surgery”, International Journal of Yoga. Bower J.E., Garet D., Sternlieb B., et al (2011) “Yoga for persistent fatigue in breast cancer survivors: A randomized control trial”, Cancer118(15) 3766-3775. Kiecolt-Glaser J.K., Bennett J.M., Andridge R., et al (2014) “Yoga’s impact on inflammation, mood and fatigue in breast cancer survivors: A randomized control trial”, Journal of Clinical Oncology.